The National Pension Scheme regulated by PFRDA is a pension program, a social security initiative by the Central Government. This scheme is open for all Indian citizens on a voluntary basis. Everyone registering under NPS will have a Tier 1 account by default. The citizens can voluntarily opt for having an NPS Tier II account. Tier I account is the default account that gets opened when you open an NPS account. Tier II, on the other hand, is a voluntary account. When you invest here, it gets invested in different funds – similar to a mutual fund. There is no lock-in period, which means the account holder can withdraw the money any time. The Tier II account is useful for those who want to make additional contributions to existing NPS, and build a huge corpus towards retirement. You also have an option to choose the category of funds where investments can be made. However, only 50% of the amount can be invested in equity funds. If you don’t choose, the fund automatically selects instruments based on your income, age and risk profile. Any person (subscriber), who has an active Tier I account can apply for a Tier II account. i. The Tier II account has to be opened through the “Subscriber’s POP-SP”. ii. The applicant needs to download the Annexure 1: Tier II Details form and send it duly filled to the POP-SP. You will find this form under the ‘Subscriber Registration’ section. iii. Also, you must provide your bank account details to open a Tier II account because any withdrawals will be directly transferred to your bank account. Step 1: Visit the electronic National Pension system (eNPS). Click on “Tier II activation” tab. Here, you can also view this in Hindi or English language. 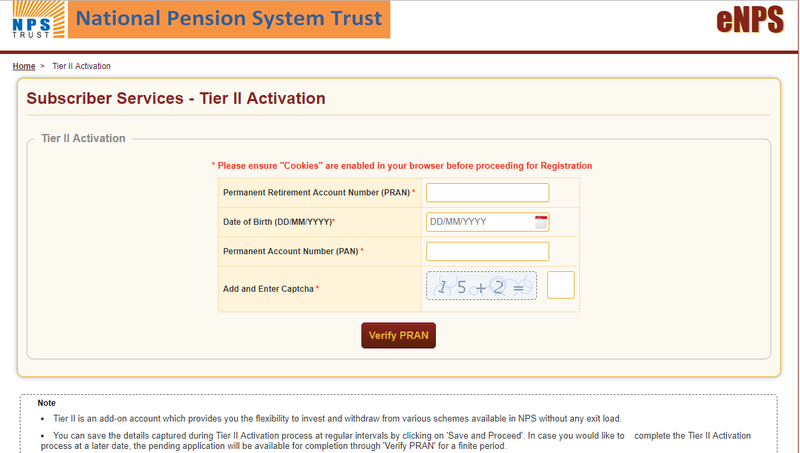 Step 2: After clicking on Tier II activation, a window opens which asks for details like Permanent Retirement Account Number, Date of Birth and PAN. Here, one has to click on “Verify PRAN”. Once this PRAN is verified with the Tier I account details, his Tier II account will be activated. i. Note that a Tier I and Tier II account can also be opened together by submitting a composite application form. ii. One can withdraw any amount from the Tier II account at any time without paying any penalty. iii. Any contribution made towards Tier II accounts are not eligible for 80C deduction. iv. Minimum amount mandatory for opening an NPS Tier II is Rs. 1000. Read more about the National Pension System and see how it compares to other tax-saving investments that you can make under Section 80C.